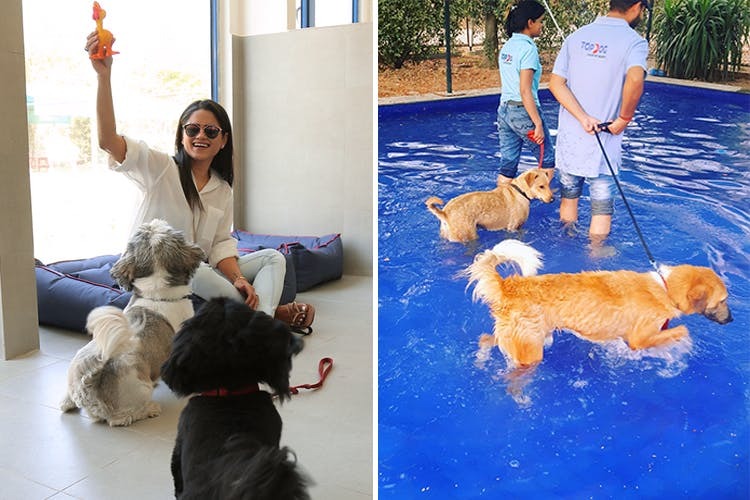 Gurgaon’s newest luxury pet resort sets your pet up with a gorgeous pool, doggie day care, a very fancy grooming lounge, overnight boarding and more – so that they get themselves a full session of pampering. The services at TopDog Luxury Pet Resort seriously make us want to switch lives with our pets. We’ll begin with the basics – they have daycare services at INR 200 per hour, so you can leave your pet for a portion of the day (or the whole day) with their own personal human to supervise walks, fun activities and pool time in air-conditioned rooms with soothing music. Did we mention each room has its own private yard? Moving on to their overnight facilities, you can check your pet into one of their three categories of rooms – complete with CCTVs, two complimentary meals, treats, play time and socialisation activities. There’s an on-call vet, a pet boutique you can pick up carefully selected products from, and the Scoopy Scrub Grooming Lounge to treat them to some pampering. Let us tell you about what goes on there – your pet can get streaks, aromatherapy washes, relaxing massages, show-grooming and – wait for it – pawdicures! You can rent out their pool for a private puppy party, humans are allowed to go splash around with their pets too. They plan on starting a pet taxi service soon. Your pets are always around to pamper you – sometimes they need some pampering right back. Topdog resorts are just where you should take them for some absolutely royal treatment. They also have behavioural modification programs for dogs, so you can check these out for training your dog. Check out their website for more details.